When it comes to tea, each country in Asia has his own “recipe” not only for the brewing, but for everything revolving around it. Tea (chá, 茶) can be considered the most important social drink in Asia for its own merits, having deep roots in the Chinese history, culture and philosophic-religious schools (Zen, Buddhism or Confucianism): all of them linked the consumption of tea with inner peace, meditation and other spiritual things, as well as consider it a cure for many diseases. 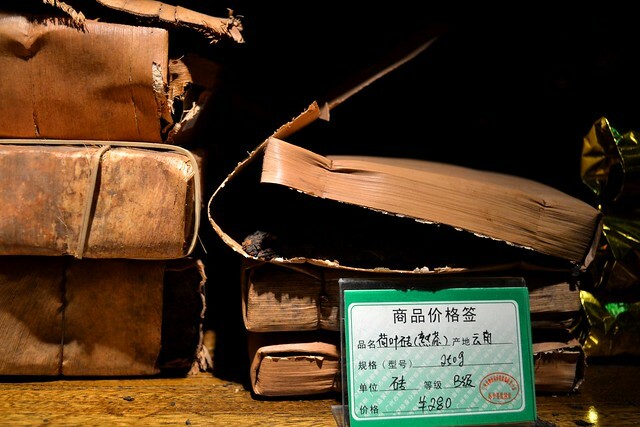 It was so important that in some moments in history, it was used as a currency, and it pushed the manufacture of teaware and Chinese porcelain, brought to Europe by Marco Polo. Tea and tea culture is present in areas like medicine, arts, literature, and religion, relating and feeding off each other since centuries ago. All these elements compose the Chinese way of tea: their own tea-related traditions, history and culture, involving the process (preparation, presentation of the tea leaves, steeping) and the social interaction that tea is supposed to incite. First things first, there’s only one plant that ‘makes’ tea: the Camellia sinensis. So if you are buying or drinking something called rooibos, chamomile, bergamot or something else, it is not tea. It is an herbal infusion, but not tea. To make it clearer, the term chá, pinyin for the Chinese word 茶 (tea), comes from the word cháshù (茶树): tea-plant (the camellia Sinensis). Also, the difference between varieties of tea (green, black or oolong) is made during the processing of the leaves, but again, they all come from the same plant. 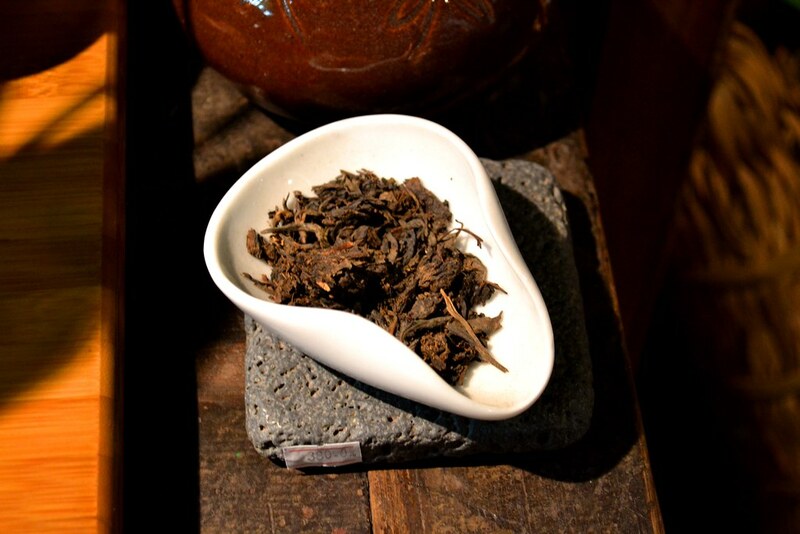 The leaf is the only part of the plant used in the brewing, and it can have many sizes, but in theory, the smaller the leaf, the more expensive tea is, because it is believed that the flavor will be better. However, do not take this too seriously: every kind of tea, brand, method of brewing gives tea a unique flavor, so it is up to you to discover and appreciate them! The tools for brewing and serving tea are diverse, and depend on the ceremony, situation and type of tea, but the best and most common are the traditional Chinese teapots made of unglazed clay, seasoned from years of use if you’re lucky enough to get them. 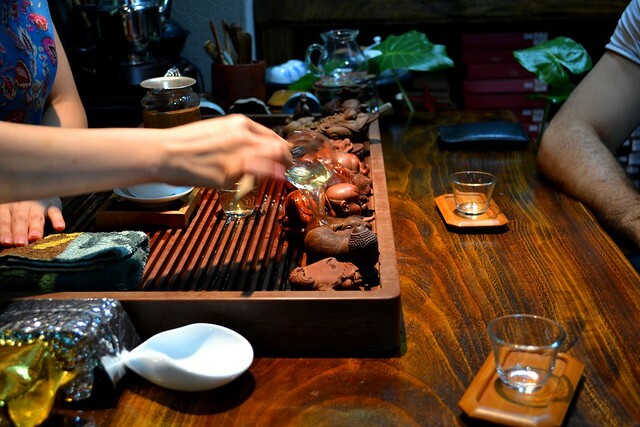 Clay is supposed to absorb the essence and flavor from all infusions poured into it, and eventually, over time, develop a glazed appearance on the inside, and the ideal clay to make this teaware is allegedly from Yixing, a small town near Shanghai, highly appreciated all over the country. There are different ceremonies for making tea if we understanding the term ‘ceremony’ as the ritualized preparation and serving of the tea, such as the Kung Fu, the Gaiwan, Perennial, Wu-Wo, Tibetan, and of course, simple methods such as a teapot and boiling water. I’ve seen the Gaiwan ceremony mostly in fancy restaurants while the “kettle method” (tea and water until leafs whites) is more for informal consumption and in some traditional restaurants. 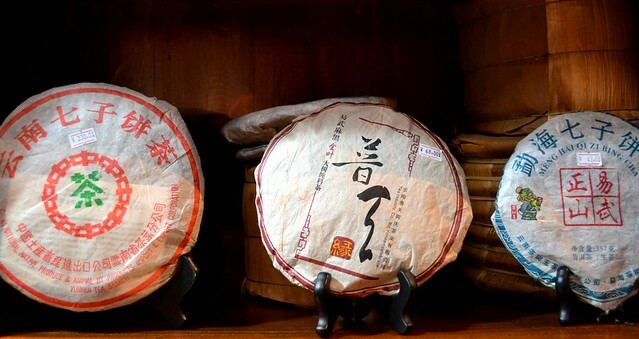 Usually, the commercial brewing is known as Gong Fu tea ceremony, or indistinctly Kong Fu, which is the one that follows. 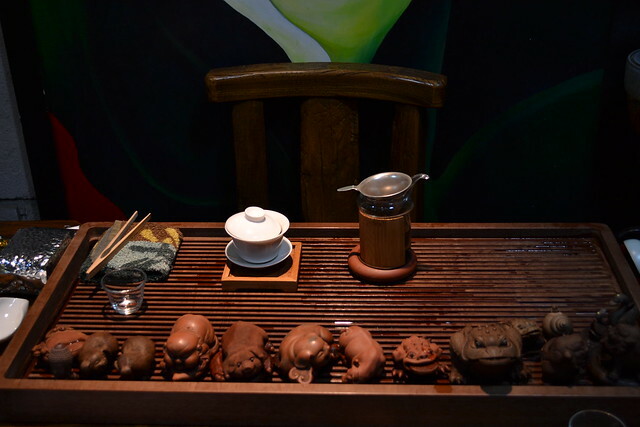 Every time the tea ceremony is performed, hot water is poured all over the figures and cups to warm them up, as seen in the photo above. There’s a draining tray below the tea set table (called ‘tea boat’), so the water will not spill. After this initial rinsing of the teaware and lucky charms, the tea is presented in a tea holder, from which the tea leaves are actually picked up for the brewing, not straight from the bag, so the customers or guests on the table can examine and appreciate its appearance, smell, and other characteristics. 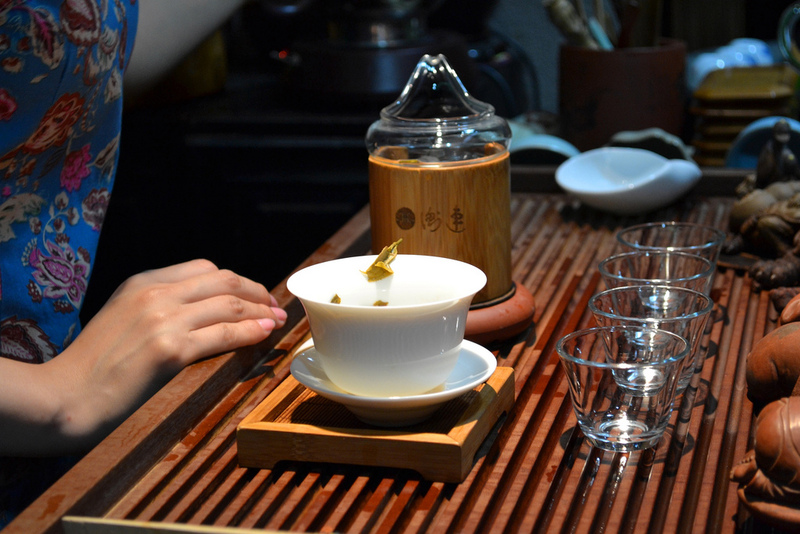 The leaves are picked from the tea holder and put in a Gaiwan cup (the white one in the pictures below), rinsed with some hot water from the teapot and almost immediately discarded after filtering the leaves. This way, dust and other particles are washed from the leaves, and any bubbles formed on the surface are scooped away with the lid of the Gaiwan itself. After this ‘fast rinsing’, more hot water is poured into the Gaiwan cup now to brew the tea leaves inside, freeing the first notes of their aroma. This first brew is poured into the cups but not drunk. The Gaiwan is refilled with new hot water from the teapot and left to steep. 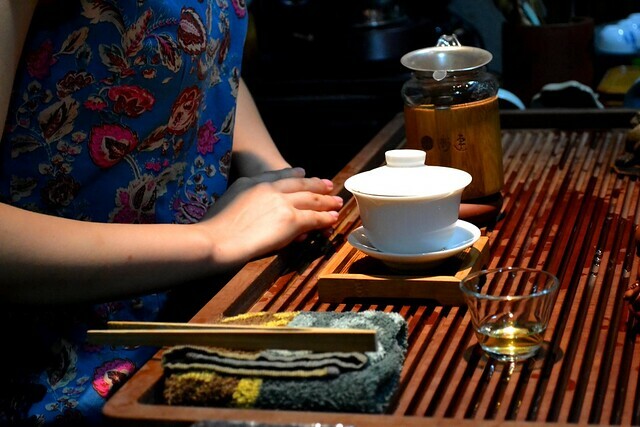 After the pertinent brewing time, it is poured into another vessel, called tea pitcher or fair cup, using the lid of the Gaiwan to keep the leaves inside. 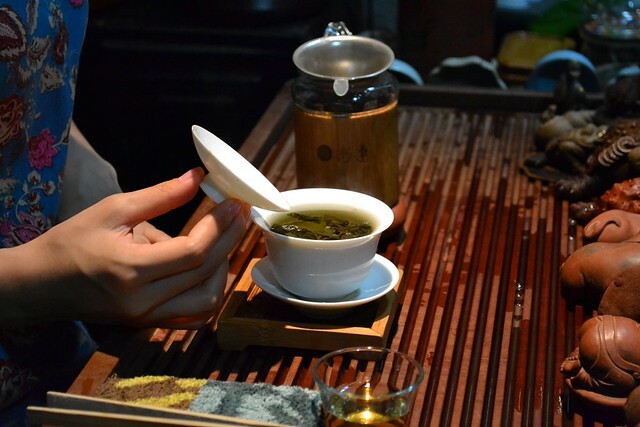 The fair cup is used to prepare the tea with the same density and taste before actually serving it (because the same tea leaves are steeped several times in the Gaiwan cup), to appreciate their flavor points over time and dilution (seen in the set above). 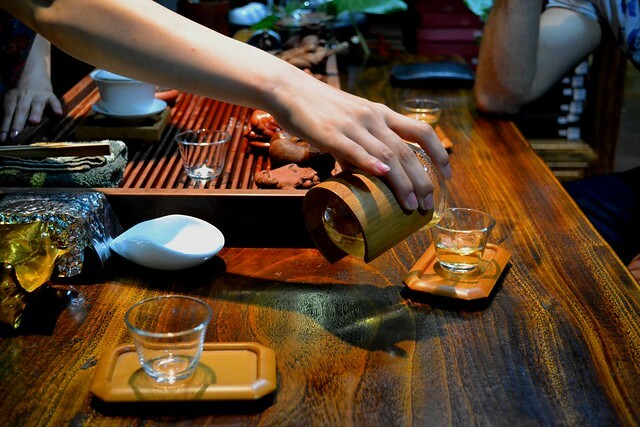 The Chinese tea ceremony emphasizes on the tea rather than the ceremony (the Japanese tradition is just the opposite), and how it tastes in the successive rounds of drinking. The performer should do it in calm and relaxed manners to create a peaceful and neutral environment to enjoy the tea, and the drinkers are the ones who should “fill” the room with their conversations. Sometimes you will see a person knocking fingers on the table when another pours some tea in his cup. This knocking is done with the index and middle fingers. This is not a Morse code or something else between the customer and the waiter, as I thought when I saw it. It’s a sign of appreciation. The history goes like this: Chinese emperor, long time ago, Ching dynasty or so, likes to dress casual and go around the country with a discrete court of servants, all of them low profile. One day, in a restaurant, after pouring himself a cup of tea, the emperor filled the servant’s too. Having an Emperor serving you was something extraordinary and an act of immense grace by the Emperor, so the servant wanted to kneel to pay respect and gratitude, but being told to stay discrete, instead of that, he knelt with the fingers, as if they were legs. This tapping is still in use nowadays as a sign of courtesy and politeness when someone pours you a cup of tea or top up your cup. To make a good tea, water is as important as the product itself. Tap water in China is low quality, so you have to buy bottled one for daily life and use. It’s not only about the bacteria and microbial stuff (that can be wiped out easily boiling the water), but about the chemicals and taste that sometimes, depending where you live, water can carry with. Keep in mind that each kind of tea has its own water temperature: green tea is ruined with boiling water while black tea can easily handle it. Regarding the infusing time, take into account that combinations of water temperature and the time leafs are left in the teapot can give a vast array of tones and points of flavor. Lifehacker has a great guide to this (see links at the bottom). For me, it’s the most important part of drinking tea. The ceremony is nice and exotic, but it is done only on certain special occasions. Tea time is not about making all the drama of the ceremony to enjoy a cup of tea but to share it. Tea is served and drunk every day, all day long, for any occasion, with anybody. 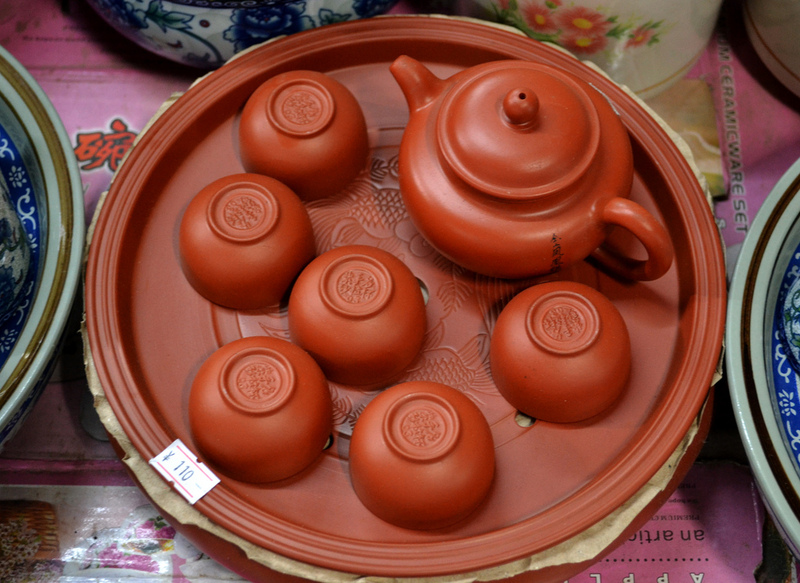 For example, it is very common to see a portable electric hot plate in many shops, with a small teapot and a rusty clay teapot being shared with customers. 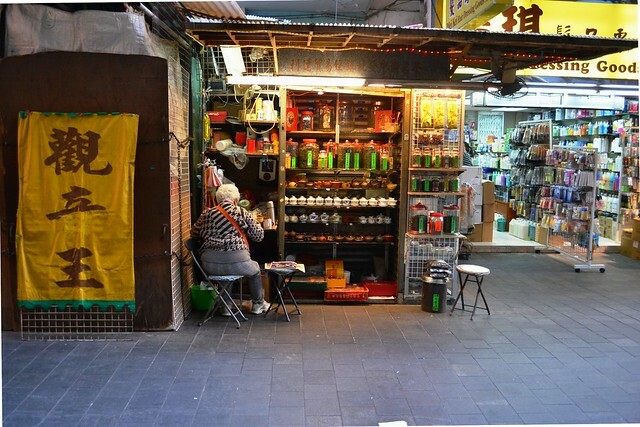 These below are from a shop open at 3am, where you could grab some food too (left) and a fruit shop, where you can enjoy a little chat before or after buying. Do not use a teabag. That’s for lazy people. Use bottled water if possible, but not distilled. Cold one, not previously boiled or flat water, would be ideal. Place the tea cup in a lacquer, wood, or bamboo holder, never directly on the table (as seen in the pictures). To appreciate the flavors and tones of the infusion, do not add sugar, milk or lemon. All the utensils and pots should never be washed with detergents or soaps, but with boiling water only. The teaware must be allowed to dry naturally. Spiced tea eggs, a recipe that combines tea with food…! The Flickr set on Chinese tea, with a tea ceremony, diverse teaware and other ‘tea moments’ across China. Hacker’s Guide to Tea, from Lifehacker.